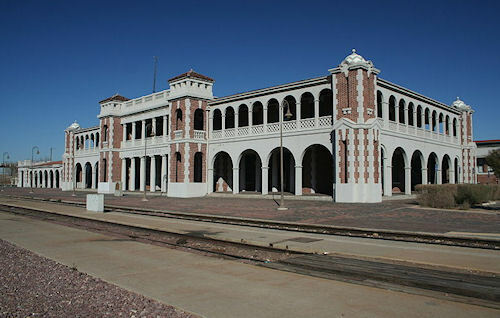 Near a dusty stretch of train track on the outskirts of Barstow, California, the imposing Casa del Desierto - or House of the Desert - stands silent, its arched colonnade emptied of the railroad passengers, restaurant diners, and overnight guests who once visited its elegant hotel. The façade no longer greets crowds of visitors, interrupting their journey for a respite at this cosmopolitan oasis. In fact, of around 100 Harvey House restaurants and hotels that were once scattered across this vast expanse of American desert, only a handful are still standing today.